The new presidential administration has a problem with accurate information. The number of falsehoods that pile up on a daily basis is unnerving enough, but according to a new USA Today report, the administration isn’t even accurately posting its own executive orders to the White House website. It’s only been three weeks since Donald Trump was sworn in as president, but the administration’s use of government websites has already been a frequent source of conflict. Among other issues, it has removed vital public information while simultaneously promoting the first lady’s jewelry line. This latest report, however, suggests an even more disturbing level of negligence. The text of executive orders that are stored in the Federal Register reflects their final, legally binding language. But that process can be slow and many look to the White House for confirmation on the exact content of an order. USA Today found at least five instances in which the White House’s version of an order differed from the official version in the register. The differences range from grammatical adjustments to correcting a citation of a non-existent law. The controversial travel ban executive order suspended the Visa Interview Waiver Program and required the secretary of State to enforce a section of the Immigration and Naturalization Act requiring an in-person interview for everyone seeking a non-immigrant visa. But the White House version of the order referred to that provision as 8 U.S.C. 1222, which requires a physical and mental examination — not 8 U.S.C. 1202, which requires an interview. An executive order on ethical standards for administration appointees, as it appears on the White House website, refers to “section 207 of title 28" of the U.S. Code. As the nonprofit news site Pro Publica reported last week, that section does not exist. The Federal Register correctly cited section 207 of title 18, which does exist. 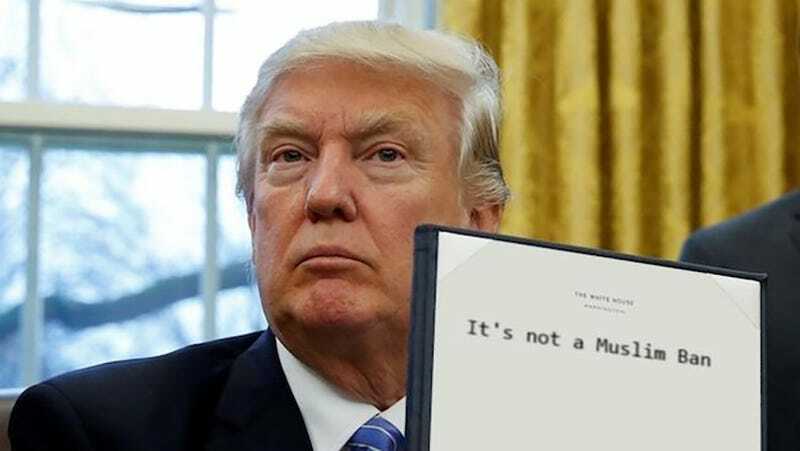 The Federal Register renumbered a presidential memorandum on a plan to defeat the Islamic State to include a Section 3. The White House version put all the effective clauses in Section 2. Gizmodo has reviewed the documents on whitehouse.gov and the inaccuracies remain. The White House has not responded to requests for comment but Jim Hemphill, special assistant to the director of the Federal Register tells USA Today, “We would never correct something that the president signs.” He says that the final documents sent to the register are what is recorded. One possibility is that the White House is publishing older drafts of executive orders. Another is that the president is signing newly revised versions that are then delivered to the register. Of course, it could be something else entirely. No one seems to know for sure what’s going on right now, a situation that reflects how generally careless the White House has been. The administration’s travel ban was broadly seen as a rushed and unvetted document that was unconstitutional. A federal court recently said as much and it appears that decision will stand. This order is estimated to affect the lives of at least 90,000 people. But the administration can’t be bothered to double-check the document, thoroughly review the legalities, properly cite case law, or (it turns out) even share the correct content of the president’s orders with the public expected to abide them. How Much Would It Cost to Rebuild the Spanish White House Website That Trump Killed?